My parents decided that, for religious reasons, there would be no television, or even a radio, in our home. They thought the TV would undermine what they were trying to teach us as children. So there was no “Three’s Company,” “MacGyver,” “Jeffersons” or even Saturday morning cartoons. I can honestly say the absence of a TV didn’t bother me as a kid; it just was one of those things. We would ask every so often—can we get a TV?—and the answer would remain the same: No. Our home was quiet, but filled with activity—instead of watching TV, we’d play games, hang out with our friends, read books, create art—normal stuff kids do. I didn’t get a TV until I was 26. On Sept. 12, 2001, my neighbor Mike gave me his so I could keep up with the news. After I plugged it into the cable, and absorbed the national tragedy, I realized, to my astonishment, that I had more than 60 free channels. I explored and found Comedy Central, ESPN Classics, Discovery and History as some of my favorites. After realizing I enjoyed watching TV, did I feel like I missed out? Not really. It means that I’m deficient in ’80s and ’90s pop culture knowledge, so I often miss the joke that someone is telling. It’s made me conscious that I have to connect with almost everyone without the help of a shared video memory. Like just about everyone else, my biggest distraction now is my phone. I have tried to limit my interaction with it, but I find that I’m constantly emailing clients, texting with friends and, as a political junkie, checking the news. I’m sure my parents would not have allowed me to use a smartphone as a child, and now I am faced with the decision of what rules to make for my children. 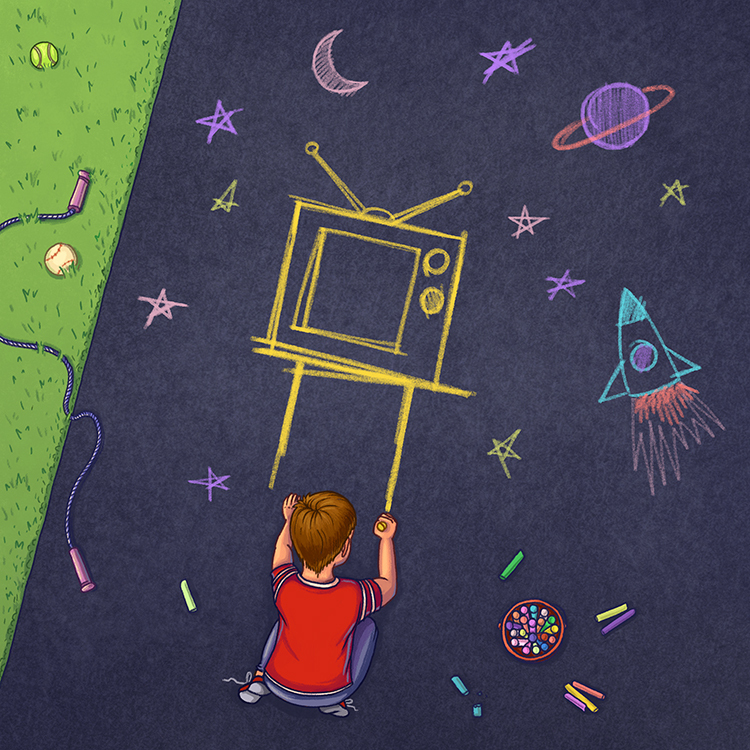 Ultimately, I feel that growing up without a TV was a privilege, almost a blessing. My head wasn’t filled with the bombardment of ideas, things to buy or—worst of all—the noise. That was one thing my mom was always constant about: a quiet home. When she was diagnosed with terminal cancer, my dad thought it would be nice for her to listen to the religious hymns we sang growing up. He had them beautifully recorded and got a CD player for their house. Soon after he brought it in, she asked him to take it out. Even as my mom was facing the end of her life, she didn’t want distraction. She wanted the quietness back. Din Clites lives in West Philly and owns Tintco, a window tinting company.